Last week I bought a new cell phone. It’s a Blackberry 8830 and it rocks. It’s got the best web browsing capabilities of any cell phone I’ve ever owned, it tethers internet to my laptop and it easily syncs all of my Outlook data to it. Plus it does really cool things with Google Maps and GPS. There’s even a geocaching program I can buy for it. My only complaint is that it doesn’t have a camera. I was able to sell my old LG phone for more than half of the cost of this phone. And since this phone is a replacement for my Pocket PC, I’m selling that too. In the end, I’ll be making almost $100 from buying this new phone. Listened to a couple episodes of a podcast tonight called Public Nuisance Radio which isn’t the best show ever, but it introduced me to a new song I like. It’s by a band called The Vandals and the song is called My Girlfriend’s Dead. It’s in their playlist so go listen to it. It seems like all my favorite podcasts have really slowed down or quit lately. I need to find some new ones to listen to. At least the first one I tried gave me some new music, even if I’m not crazy about the show. 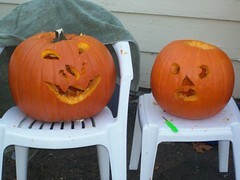 Yesterday the kids and I bought a couple pumpkins and they carved them. The one on the left is Emily’s and the one on the right is Payton’s. I was surprised to hear that they’d never done this before. I don’t know why I never got them pumpkins before, I guess I just never thought of it. I think it’s been more than 10 years since I carved one. In fact, I think the last time was when Sylvia and I stole a giant one from a pumpkin stand, not realizing that carrying it 2 miles to my parents house on foot would be really hard. Part of the time we made a sling out of our jackets and carried it between us. My cat climbs on everything. 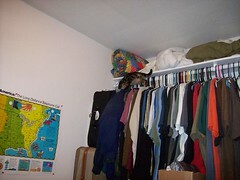 He climbed up the side of one of my shirts to get to the top of my closet in that picture. It’s annoying. I’m really torn on the issue of declawing him. But I’m starting to think it’ll have to be done soon. I thought that I wouldn’t care before since I don’t ever intend to own any nice furniture that he would scratch up. But I can’t have him destroying my shirts. 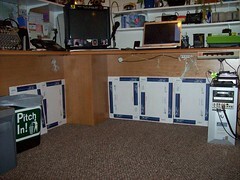 The boxes were the perfect height, and I was able to use the sticky strip on the top of them to stick them to the desk so they don’t fall over. We’ll see how long this lasts. Right now he’s laying on my lap, purring. Normally I would have thrown him out of the room by now so this is looking good. I guess his name is Charcoal since that’s what the kids are insisting on. Right now I’m listening to Episode 7 of Haxor Radio. It’s probably one of the most informative shows I’ve ever heard, covering radio shack policies and a bunch of cell phone stuff that’s interesting to me. Plus they hax0r MY Radio Shack account info. Go listen to their shows. Try clipping the cats nails once a week or so.